This post covers Stage 9, Lysevatten-Bottenstugan, of the official guide to the trail. You can also check out my report on the section before this one (hiking southbound), Stage 10. I have since returned to do a section hike of this stage, the side trails around it, and parts of the next few stages as well. You can read more about that here in my trip report of an extended exploration of Svartedalen nature reserve. * Easily one of the most beautiful stages on all of Bohusleden, much of the trail goes through the heart of the Svartedalens nature preserve and offers many gorgeous views. These vistas come at a cost, of course, and the strength of your legs will be put to the test climbing up and down many hills and cliffs. Some of the climbs are steep enough that ropes and makeshift handrails have been installed to aid hikers along the trail at certain locations. This stage will not only demand your attention because of the scenery, but you also need to literally watch your step on many paths in this section--especially less experienced backpackers will need to be extra cautious. Yet that being said: it is not the most difficult hike I have ever done either, but certainly not an easy one. The hike is well worth it, of course, and I must apologize to my readers for my admittedly amateur photography. Looking back over the pictures I took, I feel like they don't do this stage justice for how nice it really is. Though in fairness to myself, it was an overcast day for most of my hike, and a bit dark and tricky to take pictures using natural light, especially under the canopy of the forest. This is one stage that I will surely return, so perhaps I can take one of my friends that is a better photographer than I am and update this report in the future. I have quite a bit to report before getting to the pictures, so please bare with me; and don't worry, there are many (42) pictures. As I mentioned in my last report of Stage 10, I was at odds with the official guide on certain key details, and the same is true for this report. For one, there is no mention of shelter at the beginning of the stage, and the shelter symbol (which is a small red triangle) is partially obscured on the map. This is not the only time that happens, either. There is also a shelter at the other (southern) end of this stage, which is also not mentioned, and the shelter symbol is either completely obscured or absent altogether. And for the record, I checked both the English and the Swedish texts that accompany the map on the official website, and both were just as lacking. This is a shame because both shelters are quite nice and each in a very convenient setting for travelers; i.e. both have good and close water sources, plenty of space around the shelters, and both have an outhouse. 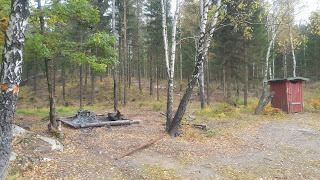 The water source at the southern end shelter is not as obvious as the shelter to the north (as I will explain more below), as the shelter to the north is right next to lake Stora Hästevatten. The trail crosses right over the lake and goes right past the shelter. As I also mentioned in my last report, the trail is now closer to the popular starting points of the small city of Kungälv and the second largest city in Sweden, Göteborg. This means that there are more backpackers and hikers the closer you get to these starting points, as most travelers I have encountered on this trail are like me and do section hikes rather than the entire Bohusleden. I ran into more backpackers on this stage and the next stage to the south (Stage 8) than any where else on the trail. To put things into perspective, last August when I started my Bohusleden adventure in the north, I ran into 6 other backpackers on the trail in 5 days. On this stage and the next I ran into 21 Germans and 10 Swedes--in less than 24 hours! So expect company during the high season in the summer months and plan accordingly. Walking down a dirt road will soon take you directly to the lake and shelter noted above. The water was very clear when I was there, and I made sure to fill up my water bottles and drink my fill of water while I took a break at the shelter. The water had good taste, and I seriously considered staying the night at the shelter, but it was far too early for me to make camp--it was the afternoon and I had not even had dinner yet. So I marched on down the dirt road, the trail continuing on soon after into the nature preserve. *Update 18/10/2015: This past weekend I returned for a section hike of this stage along with some side trails in the area. You can read my full trip report in the link at the introduction to this post. Unfortunately the shelter at the north end of this stage is no longer there. 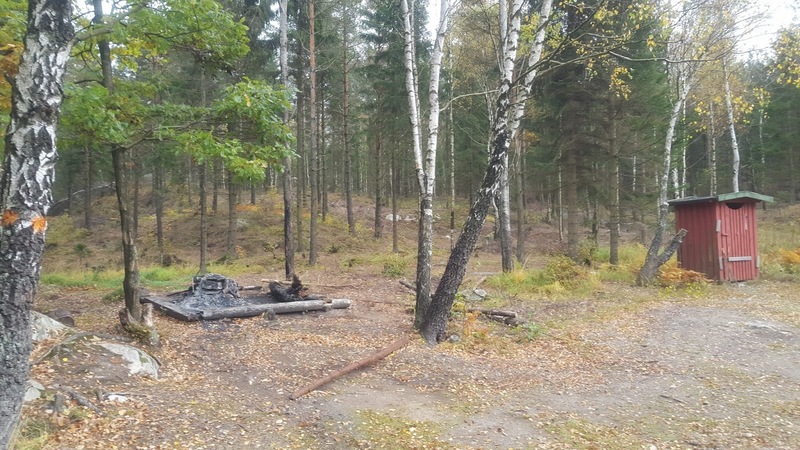 It seems like it perhaps was burnt down or damaged by fire, as there were a lot of ashes and burnt logs left over. But no shelter. Another older picture of what used to be the shelter. Up and down through marshes, across hill plateaus, and around the five lakes that you will pass as you pass through the nature reserve. It won't be too long before the blue ropes that can help you climb will become familiar sights. No lack of water here, and in spite of crossing through marshes, my feet stayed dry. And of course the views--enjoy the views. There are some nice spots to make camp by some of the lakes, like Stora Holmevatten, where on the shore I ran into 4 German guys that were making camp. Nice guys--the only ones on this trip that asked me to hang out and make camp with them, but still too early for me or I would have taken them up on the offer, especially after learning their musical interests. We talked about Thrash Metal a bit, as they said a few of them were in a Thrash band, hence my pose in the picture with them. They were low on food so I also showed them on the map how to get to the small town Lilla Edet roughly to the north-west from there. More blue ropes, hills, cliffs, plateaus, and nice views to come. At the southern end of lake Härsvatten I noticed a peninsula that looked promising to make camp, and I was not disappointed when I got there. I set up camp, ate dinner, and went for an excellent swim off the tip of the peninsula. Bugs came out in full force after the sun went down, so I took refuge in my bivy and slept under the stars. The next day after breakfast, I continued to the end of the nature reserve, where the trail follows a stream for a bit and then goes into a long stretch of mossy troll woods with many tall pine trees. After the pine woods is a grassy field, where the trail goes past a farm. Past the farm is a short woods walk and then hike on a larger dirt trail that goes past the big lake Hållesjön, with yet another vista, but this time with a picnic table--a reminder that civilization is close. The trail briefly intersects with a paved road before a final, easy walk through the woods. There is a campfire spot in a field next to some ruins. Finally at the end of the stage is one of the nicest shelter areas on the entire trail, itself having a nice view, a signature aspect of this stage. Two friendly Swedish backpackers had spent the night there and where nice enough to point out the spring that is close to the shelter. This water source is not that obvious and I saw no signs while I was there that pointed it out. It was some of the best water I have ever drank in my life, period. Cold, clean, fresh. If you walk towards the woods rather than towards the road--or in other words, if sitting on the shelter go to the right rather than the left--there is a wooden door (looks like an old school cellar door) that covers the spring, which comes directly out of the stone of the hill there. This stage took me roughly 7.5 hours to complete, not including making and breaking camp for the night, and hiking at a moderate to low pace with many breaks for water and the scenery. A real gem of the trail, and I can't wait to go back. Continue on to Stage 8.